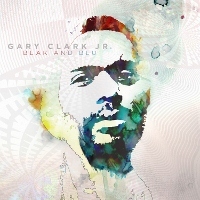 On his new album Blak and Blu out today, Clark easily satisfies – and indeed surpasses – such expectations, with an electricity and dynamism that’s rivaled, at least in recent history, perhaps only by the Tedeschi Trucks Band. While not strictly a blues record, weaving in R&B, hip hop, soul, and other sounds along the way, Clark’s debut on the Warner Brothers label offers exactly the kind of crossover appeal that can help to make the blues popular again, much the way fellow Texan Stevie Ray Vaughan did a few decades back. Never mind that half the songs here are updates on some of those one can hear on earlier (but often hard-to-find) albums from Clark, including “Bright Lights,” “Please Come Home,” and “The Life” off Clark’s self titled EP, “Travis County,” “Numb,” and “Things are Changin'” off 110, and “When My Train Pulls In” off Worry No More, several of which also of course appeared on Clark’s 2011 The Bright Lights EP. Newer fans since Clark’s break-out at the 2010 Crossroads Guitar Festival (where we snapped this picture of Clark with host Eric Clapton) will likely not yet be familiar with these tracks unless they’ve had the good fortune to see him perform, and in most instances (with the exception perhaps of the psychedelic “Numb,” to which we tend to prefer the straight-ahead bluesier sound of the 110 version), the updated cuts sound at least as good as, if not better, than first recorded, especially when buttressed by five more originals plus a tasty nine and a half minute medley of Little Johnny Taylor’s “If You Love Me Like You Say” (Albert Collins) and a reinterpreted “Third Stone from the Sun” (Jimi Hendrix). Kicking off on the swinging sounds of the album’s first single, the 28-year-old Clark exudes all kinds of coolness and confidence on the punchy, horn-laced “Ain’t Messin ‘Round,” complete with its “play it cool” falsetto chorus in addition to the first of many ripping guitar solos you’ll hear throughout the album. From there, he’s on to the slow rocking blues of the nearly eight minute “When My Train Pulls In,” filled with a mix of Zeppelin- and Hendrix-like riffs, followed by the smooth R&B sounds of the album’s title track – including trumpet from Clark himself – and the familiar yet still entrancing “Bright Lights.” “Travis County” is a romping country rocker featuring some Chuck Berry-like grooves, while “The Life” sees Clark taking a much more hip hop tone before launching into a Doyle Bramhall II co-written, Prince/Lenny Kravitz-ish “Glitter Ain’t Gold (Jumpin’ for Nothin’)” that includes Clark on congas and percussion. Outside of the aforementioned “If You Love Me Like You Say/Third Stone from the Sun” and the gritty, shuffling “Crossroads”-style closer “Next Door Neighbor Blues” (which could well be the best of the bunch, consisting only of Clark on drums and acoustic guitar and co-producer Mike Elizondo on percussion), the disc’s remaining songs all allow Clark to demonstrate his softer side, from the falsetto vocals of the slow-danceworthy, Smokey Robinson-like “Please Come Home” to the gentle breeziness of “Things are Changin'” and the fuzzy R&B sway of “You Saved Me.” Even on these lighter numbers, Clark still finds room to shine on guitar, proving that, no matter whether he’s rocking or killing it softly, you can always expect plenty of rhythm to accompany the blues of this up-and-comer. 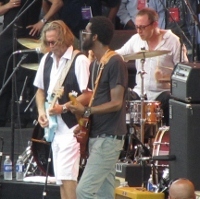 Produced by Elizondo (who also provides bass, fuzz guitar, keyboards, and/or percussion on several tracks), label chairman Rob Cavallo, and Clark, Blak and Blu also features J.J. Johnson (Tedeschi Trucks Band, John Mayer) on drums and Zac Rae on keyboards/organs, each of whom helps make this much-anticipated project from Clark one that will be remembered – and played – for a very long time. This entry was posted in Albums and tagged Gary Clark Jr.. Bookmark the permalink.